Attracted by thoughtful design and a quality finish, homebuyers looking for a new property in Yate have already snapped up half of the properties on Newland Homes’ Amberley development. With a variety of different home types, Amberley has given purchasers the choice and flexibility to find a home that suits their lifestyle. Homes boast desirable open-plan layouts and neat design touches that maximises light and space, whilst also ensuring comfort and efficiency. There are currently three and four bedroom homes available at Amberley. Prospective purchasers can visit two showhomes on the development to see the finish and quality that comes as standard with Newland Homes. Visitors are often surprised that quality brand Neff ovens and dishwashers, plus downlighters, come as standard in the kitchen, with Villeroy and Boch sanitary ware, downlighters and chrome towel radiators to the bathrooms and ensuites, as well as turf to the rear gardens. 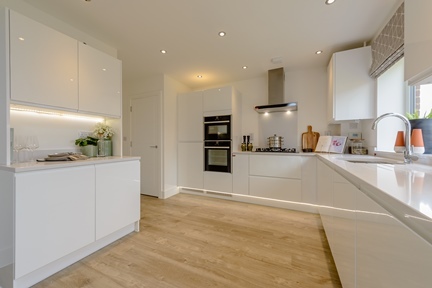 The four bedroom Prestbury showhome demonstrates how the kitchen is the heart of the home with an open-plan dining space and kitchen with feature island, opening directly onto the garden. The Hampton four bedroom home is also available to view which boasts an impressive master bedroom suite on the top floor of this three storey home, complete with en-suite and walk-in wardrobe. Very soon, Newland Homes will also be opening a new showhome, the four bedroom detached Hilmarton. This is an attractive double-fronted four bedroom detached home with kitchen/breakfast room boasting central island and French doors on to the garden. With three double bedrooms and one single, there is room for growing families as well as for those just looking for extra space. Gail Remnant, Associate Sales Director at Newland Homes, said: “Amberley has proved to be very popular with local homebuyers looking for a well-designed home that not only looks good but works for modern living. The added benefits of Amberley is that it is a small development of just 31 homes, which are set across three cul-de-sacs on a no-through road, so there is a real feel of privacy and exclusivity, as well as the quality features that come as standard. Other developers often scrimp on the features that come as standard with one of our homes and then purchasers can be faced with a large bill to have the quality of home they were expecting. So many are pleasantly surprised when considering a Newland home.